Oracle Cards extends the theories presented in 'The Mystic Test Book' and provides a framework through which to Manifest your Destiny. Please see the History topic for an overview of the content present in this section. According to 'The Mystic Test Book', a work published in 1893 by Olney Richmond, the playing cards have been around for quite a long time. In fact, he claims that they originated in Atlantis and have since been used as Oracles by both gypsies and "The Mystic Brotherhood". According to the text, Olney was Grand Master of the Inner Temple of the Ancient Order of the Magi. The theory brought forth describes the manner in which the playing cards can be used in predicting future events, as well as describing how past events created the current situation. Using a mathematical formula, one of the 52 playing cards is assigned to each day of the year. Due to the formula, an individual card may be associated with one or many different days of the year. A person born on that day will tend to have qualities associated with the Oracle Card for that day (see Calendar, or use the interface below to automatically calculate Your Card). When ready to start the Tutorial, see the Solar Book. Select your birth month and day to find your card. Enter your name below and click the 'Set Name' button. Each card in the deck can be seen as an oracle to use as an intuitive tool for self-analysis. However, as a reflection of humanity, Oracle Cards are generally viewed in relation to each other. As an example, consider the way in which astrology is used to provide a person with information about their propensities based on the time, day and year of their birth. This information takes into account the location of all of the planets at the exact time of birth, noting the sign that is rising at that very moment. 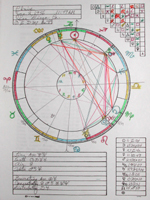 When doing a reading for that individual, an astrologer would take into account not just the location of the sun, but of all the planets (especially the moon) and the ascendant sign, the one rising. In order to get an accurate description of the propensities underlying each Oracle Card, we need to know its position within the framework of all cards (see The Solar Book).